Fatigue involves the failure of materials under cyclic loading, where the maximum load can be significantly lower than that required to cause static failure. Polymeric adhesives, like most materials, are susceptible to fatigue failure, and, hence, fatigue should be accounted for when designing bonded structures subjected to cyclic loading. 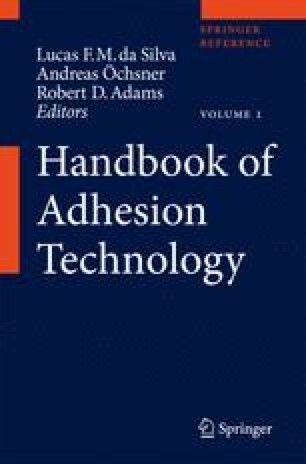 Adhesive joints have potentially good fatigue resistance compared with other joining methods; however, they are also susceptible to accelerated fatigue failure due to the actions of environmental ageing or viscoelastic creep. In this chapter, the effect of the environment and various fatigue loading parameters on the fatigue behavior of adhesively bonded joints is discussed before describing the main methods of characterizing and predicting fatigue. Traditionally, fatigue behavior has been characterized through the use of experimentally derived stress-life plots, and fracture mechanics–based progressive crack growth methods have also been widely discussed. In more recent years, damage mechanics–based progressive modelling methods have been proposed that have the advantage of predicting both initiation and crack progression phases of fatigue and have also been shown to be readily adapted to the prediction of variable amplitude fatigue and combined fatigue-environmental ageing. The chapter finishes with descriptions of two special cases of fatigue: creep-fatigue and impact fatigue, which have been shown to be extremely detrimental to the fatigue life of bonded joints under certain conditions.